German statesman, son of Georg Barthold. After studying law in Kiel, Bonn, Halle and Berlin he worked for the Prussian Ministry of Culture and collaborated with the conservative review Kreuzzeitung, founded in 1848. In the years that followed he became an important politic ian in the Prussia of Frederick William IV who, in 1854, appointed him Cabinet Counselor. In 1856, the theft of some diplomatic documents that he was entrusted with irremediably prejudiced his health. His writings are not significant. 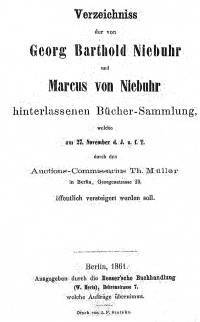 Verzeichniss der von Georg Barthold Niebuhr und Marcus von Niebuhr hinterlassenen Bücher-Sammlung, Berlin, Besser’sche Buchhandlung 1861, [Jena, Druck von Fr. Frommann 1861], [IV] + 74 p.
The catalogue of the library of G. B. Niebuhr and his son was compiled on the occasion of the sale that occurred in 1861, on the death of the latter. The catalogue shows a second title-page with the typographic reference: «Jena 1861». It consists of 2390 titles divided into thematic classes, some of them divided into subclasses. The order of the titles in every single section is alphabetical. No indication of whether the books belonged to G.B. Niebuhr or to his son can be found. There is an auction catalogue concerning the library of G.B. Niebuhr, a copy of which is kept in the library of the University of Leipzig: Verzeichniß einer dem Nachlaß des [...] B. G. Niebuhr angehörigen Bücher-Sammlung, welche nebst Anhange Donnerstag d. 9. Januar 1845 [...] versteigert werden soll Ort, Bonn, Verlag Krüger, 1844.